The u se of electricity in the IT sector has both financial and environmental significance. Many data centres consume as much electricity in their cooling systems as in their servers. This has both cost and power availability implications. It is believed the IT sector has a bigger carbon footprint than air travel and consumes over 5% of the developed world’s electricity. Many operators want to reduce their impact on the environment by consuming less energy. An EcoCooling direct evapoative cooling system can reduce your IT or data centre cooling costs by up to 90%, comply with ASHRAE 9.9 and produce a PUE (Power Usage Effectiveness) of under 1.1. Low power usage at partial loads: The effect of fan speed on power drain is governed by a cubed relationship, meaning that at half the speed the fan will be using an eighth of the electricity. Operating the EcoCooling system at half speed reduces the fan energy use by over 85%. Free cooling is an economical method of using low external air temperatures to reduce the amount of additional cooling required. When the ambient external temperature is below the desired supply set point the CREC® system can run in ventilation and attemperation mode. On warmer days of the year, evaporative cooling is used to cool the supply air. 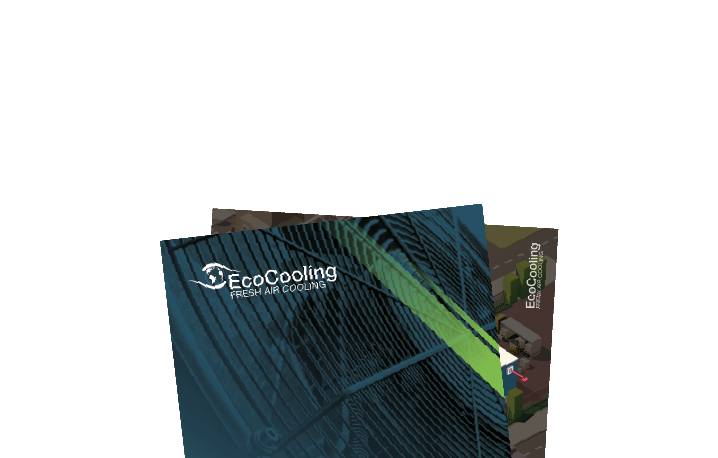 EcoCooling CREC® control systems and EcoCoolers (direct evaporative cooling) can exploit the full free cooling envelope. 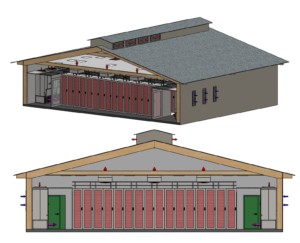 Colder locations, such as the Nordics, (see Hydro66 case study) where there are conditions for free cooling and an abundance of low-carbon hydropower, are becoming more popular for data centre operators and builders. The key advantages are low-cost cooling and power, and practically unlimited renewable generation capacity and grid infrastructure to support large data centres. 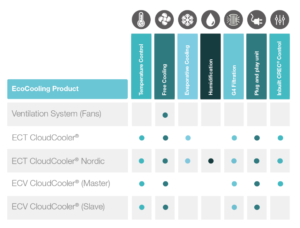 EcoCooling’s Nordic range has been specifically developed by in-house engineers to accommodate Nordic data centre requirements including the very low temperatures which can result in low humidity environments. The internationally accepted environmental standards for running data centres are contained in the ASHRAE TC 9.9 guidelines. Temperature, humidity and contamination levels are all identified as important factors when designing a fresh air or evaporative cooling system for a server room or data centre. EcoCooling solutions optimise the cooling efficiency and provide acceptable conditions for the majority of the time. Visit the ASHRAE website here. Temperature While ASHRAE has an allowable range from 15-32°C, care should be taken running at high temperatures as server ventilation has been shown to increase its energy use at temperatures over 25°C. Systems can provide supply air temperatures below 25°C all year round in the UK and most of Europe. Control systems provide close control (+/-1°C) and a large percentage of the year 16°C supply air temperature delivery is achievable. Humidity The ASHRAE allowable range is between 20-80% relative humidity. Low humidity can result in electrostatic discharge. High humidity, in combination with certain contaminants, can result in corrosion. CREC control systems can automatically transfer the cooling to 3rd party backup systems if the humidity levels exceed the pre-set parameters. Contaminants EcoCooling products are based on direct fresh air cooling. It is strongly recommended that all IT cooling systems using direct evaporative cooling be designed with a minimum of G4/EU4 grade filtration at both the supply and recirculation points. A range of filtration products up to F7/EU7 grade are available. See the table below for our full range of evaoprative cooling and free cooling products and associated cooling capacities over different ∆T (Temperature gain in the room due to the IT equipment) = Temperature of Extract Air – Temperature of Supply Air. Our ECV CloudCooler is a our basic free cooling offering. The ECV is is simple to install and maintain and has proven popular with mining facilities based in the Nordics, where ambient temperatures are very low and no supplementary cooling is required. This is also available as a 3 Cooler Group racking system for ASIC cryptocurrency mining. 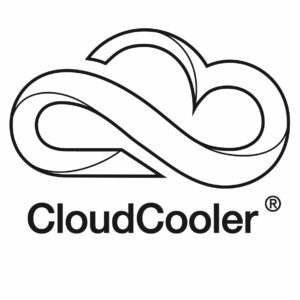 Our ECT CloudCooler contains an evaporative cooling and humidification loop. 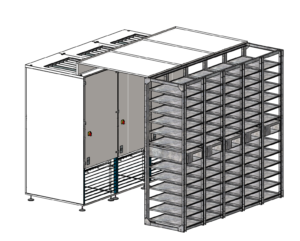 This has been used by facilities in central Europe and the UK who require supplementary cooling on the warmest days to avoid high supply temperatures.